There’s a lot of talk in the media these days about air quality. But who really has a clue how polluted the air is in their own home or work place? Now Luxembourg based company, Airboxlab have brought their connected indoor air quality monitor Foobot to the UK. We setup Foobot in the AV Room at the Automated Home. The install is a 5 minute job using the iOS or Android app. The white cylindrical sensor sits passively in your room, measuring and logging the changing quality of your air over time. The machine takes 6 days to settle and calibrate itself when newly installed or moved to another room. The World Health Organisation says air pollution was estimated to cause 3 million premature deaths worldwide in 2012. 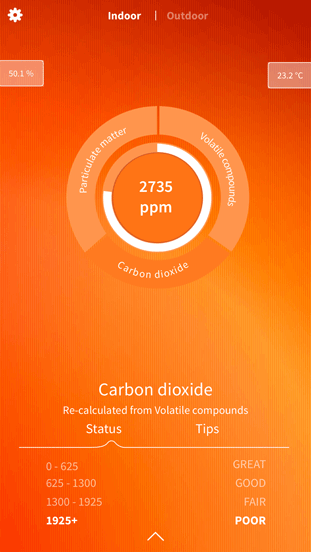 Foobot measures some of the worst culprates – VOCs, PM2.5s, CO2 as well as temperature and humidity. Results are logged to the app every 5 minutes. Poor air quality can have side effects from fatigue and headaches to aggravating allergies and asthma. When Foobots LEDs are blue all is well (LED’s can be dimmed, scheduled to be on at certain times only, or switched off completely). 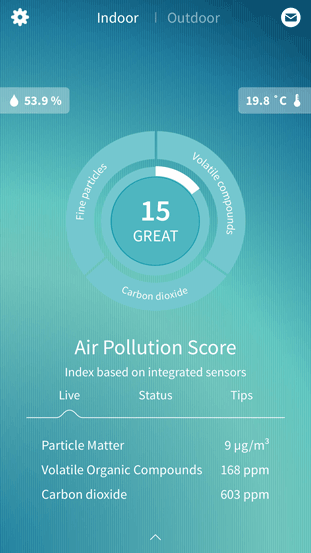 Foobot takes readings from the 3 pollution categories and combines them to give you an air quality score. The lower the number the better. Once they rise above a threshold the colour of the lights changes to orange then it’s time to open the app and investigate. The apps background colour mirrors the LEDs on the hardware too. PM2.5s seem to be particularly dangerous and although perhaps associated mostly with Diesel cars, these tiny particulates can also come from those fancy candles in a jar my Mrs loves as well as wood burning stoves and cooking. Volatile organic compounds can come from things like the glue used in your furniture or cleaning products. Using aerosols can all set the alarm bells ringing too. We’ve regularly seen very high CO2 levels although It seems the Foobot uses an algorithm to calculate CO2 levels rather than having a specific sensor for it on board. Outside air quality is also reported in the app using 3rd party data from Breezometer.com – in our case however this was from a town about 250 miles away. We’re not huge fans of the current app design. It’s pretty enough, but seems a little ‘form over function’. Parts of it are low contrast and hard to read, even on a big iPhone Plus. 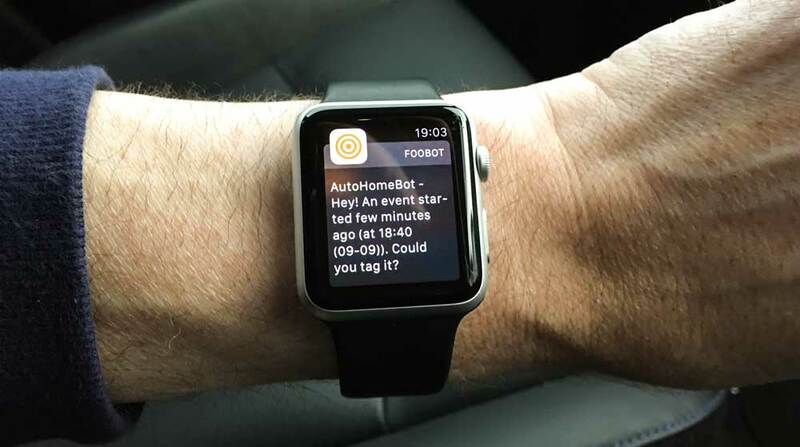 Foobot often sends us messages about pollution ‘events’ asking us to tag what we were doing. Many of these happen when we’re out of the house so it’s impossible to track down the cause. Once peeling an orange in the room was enough to set the system off. Although there’s currently no way to directly export your data from the app, a couple of clicks on IFTTT turns on the recipe to automatically record your Foobot data into a Google spreadsheet. You can see some of the details here. Foobot is an interesting piece of tech that can provide a real insight into the air quality in your home. Just like with Energy Monitors though, this is just the first step. Once you’re armed with the data then it’s up to you to make the changes. That could be a simple as opening a window for a few minutes or following some of the 49 tips and tricks Foobot provide in this ebook. There’s plenty of additional reading available from Foobots Good Air Resources Center too. Hopefully the price can fall as this sector gets more popular and more units ship. We’d like to see a desktop browser interface to Foobot and an improved UI on the app too. We’ve already seen several app updates in the few weeks that we’ve had the monitor though, so I’m sure improvements will continue. 2 Comments on "Review: Foobot is Your Smart Home Air Quality Monitor"
I’ve just bought one of the alternative devices – the Flow from Plume Labs. The Flow has more of a focus on outdoor air pollution (and hence GPS tracking etc.) but it works indoors too. I find it interesting to see how the indoor and outdoor pollution levels compare – more VOCs indoors, as you’d expect, but more PMs outdoors which suggests the filters on the MVHR are quite good at removing those. @David – thanks for the info. Good to hear the MVHR is doing its job. BTW I’ve enjoyed reading your site and following your project over the last few years, great resource.